To the north west of the crossroads at Weston Coyney the ground rises steeply to almost 250 metres above sea level. This area, known as Park Hall Hills takes its name from the Hall which stood on lower ground to the south. For generations the hills, as yet unscarred by quarry working, had attracted local children and provided a vantage point with excellent views of most of the surrounding area. Shortly after the outbreak of the war the residents suddenly found that the area had been surrounded by a fence, the road running through the hills was closed and protected by an armed guard. Clearly it was something to do with the war effort but very few people had any idea what was going on `up the hills` and certainly no idea of why the activities were classed as top secret. This is perhaps just as well, because if the residents of Weston Coyney and Hulme had known what was taking place they would have had more reason to fear enemy air-raids than their neighbours might have done. The map on the left reveals the location of the various sites that were a part of the wartime scene. At the bottom of the map is the Home Guard H.Q. which was located at the windmill at Meir Heath. The civil aerodrome at Meir had been taken over by the R.A.F. The Rootes Shadow factories were built to produce aircraft including the Blenheim and the Beaufighter. To the south east of Weston Coyney crossroads stood Weston Coyney Hall, no longer used as a residence it provided a base for the Home Guard Platoon. The location of the secret site is depicted on the map using the wartime code name – QL Site. During the early stages of the war a Searchlight Unit was located adjacent to the present day entrance to the Country Park on the Weston Coyney to Leek Road. A few miles to the west is the small town of Cheadle, a Radio Monitoring Station operated by the Air Ministry was located at Woodhead Hall near to the town. The staff at the monitoring station were sworn to secrecy and it is only within the past few years that the important work carried out at Cheadle has been acknowledged. Woodhead Hall was at that time an Air Ministry `Y` Station monitoring the radio signals of the enemy. It was the central hub of a network of stations intercepting the coded messages sent by the Luftwaffe and other enemy units. As the dark clouds of war gathered on the horizon the Government established a department with Colonel John Turner at its head. Based at the Sound City Film studios at Shepperton the purpose of this new and top secret department was to confuse and deceive the enemy by creating decoys and dummies such as inflatable aircraft and vehicles. A large scale programme was put in place to build a mock or decoy aerodrome in the vicinity of many of the real aerodromes across the country. At the outbreak of war aircraft navigation was based on the principles of `dead reckoning` assisted by visual references to the ground below. Courses were plotted on the basis of an estimated wind speed and direction, the navigator making adjustments to the course during the flight. Then as now, the weather forecast was not always accurate and an aircraft could expect to arrive in the general area of its target rather than precisely overhead. This was particularly true at night when the landscape below was subject to the blackout regulations. The decoy aerodromes were designed to take advantage of these facts and to deceive the enemy bomber crews so that they dropped their bombs in the wrong place. 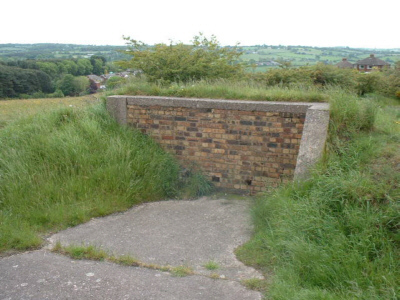 The site located on the top of Park Hall Hills was probably a decoy for the real aerodrome at Meir. The name `QL Site` denotes a site that was intended to create a night-time deception by the ingenious use of electrical lighting. On a typical QL Site dummy flare-paths were constructed and car headlamps were suspended on wires between supports to simulate aircraft moving on the ground. An array of low intensity lights was cleverly arranged to simulate lights carelessly left on in buildings and persons opening external doors without first switching the room lights off. The site was controlled from a brick and concrete building which was built to a standard design. Earth was ramped up against the walls and the construction covered with clods of turf. I have not been able to locate any photographs of the control building on Park Hall Hills but Mr Russell Barnes has kindly given his consent to allow his photograph of the site at Siddick to be used here. The vertical blast-protection wall can clearly be seen on the right in this photograph. A blast-protection wall was constructed across the entrance passage. The building contained two rooms. One of the rooms housed a petrol driven generator which provided the electricity supply for the decoy lighting. The other room housed the telephones and the equipment for controlling the lights. An escape / observation hatch was built into the roof and this was reached by a metal ladder which was secured to the wall. The building at Park Hall was partly demolished when the City Council designated the area as a country park. Very little remains today of the Control Building on Park Hall Hills. The roof and two of the side walls have been demolished. The photograph on the left shows what remains of the western elevation and the floor area of one of the rooms. The entrance passage was on the left of the building and the blast-protection wall faced towards Cellarhead. In the absence of official documents the recollections of local residents support the theory that this was a Decoy Site. They recall that the site was manned by a number of airmen and that they were billeted in Weston Coyney. They used a lorry to drive to and from the site, probably working in shifts around the clock. These were similar to the arrangements that were in place at other known decoy sites. Some residents recall hearing talk of a “mock aerodrome” but perhaps at the time no one realised that the purpose of the site was to lure the enemy bombers away from Meir and instead towards the inhabitants of Weston Coyney. It seems that as the threat of enemy air raids receded the site was eventually abandoned. As with many other sites around the country the control building was left in place. For generations of children it served as their imaginary fort or submarine, little guessing that it was once a part of the largest planned deception mounted in the British Isles.